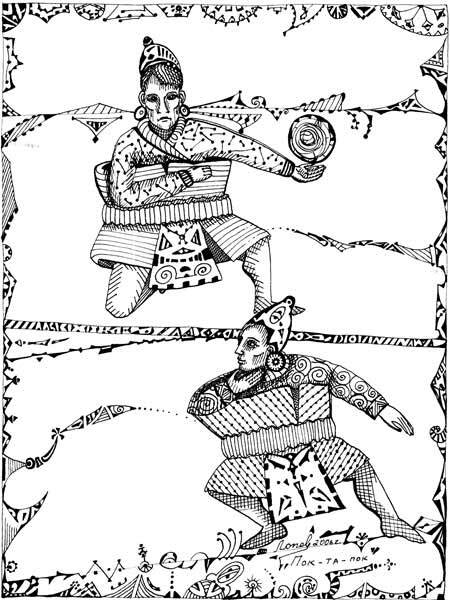 The play of leather ball emerged in the counry of ancient Maya is a prototype of all sport games with ball. It was a ritual from the beginning, the losing team was sacrificed to various gods as required. If there was drought, then to God of rain Chak-mool, if they waited for the harvest then to the Goddess of fertility Tlasolteoatl, and the God of war Huitzilopochtli took his during war. The winners were respected as gods, they installed monuments in their honor, so it was worth to play. For pok-ta-pok they constructed intricate stadiums, for example one of them the place of ruler was equipped with complicated system of resonators and when he spoke his voice sounded arounded the stadium like thunder.